Which Cold Smoke Generator Is Best? You need to invest in a cold smoke generator if you are going to attempt to make my cold smoked Scotch salmon recipe or smoke cheese. I say "invest" and it sounds like a complicated piece of kit but really it's quite simple and they are inexpensive to buy. That said, don't just reserve it for cold smoked salmon or cheese. You can smoke butter, salt, oil, kippers... the list goes on. Cold smoking must take place at temperatures below 30°C (85°F) so do your cold smoking when the ambient temperature is cool. You can use a cold smoke generator in almost any cabinet or food chamber provided that there is ventilation top and bottom to create an air flow. I use mine on the fire grate of my ceramic barbecue and lay out the food to be smoked on the cooking grate. 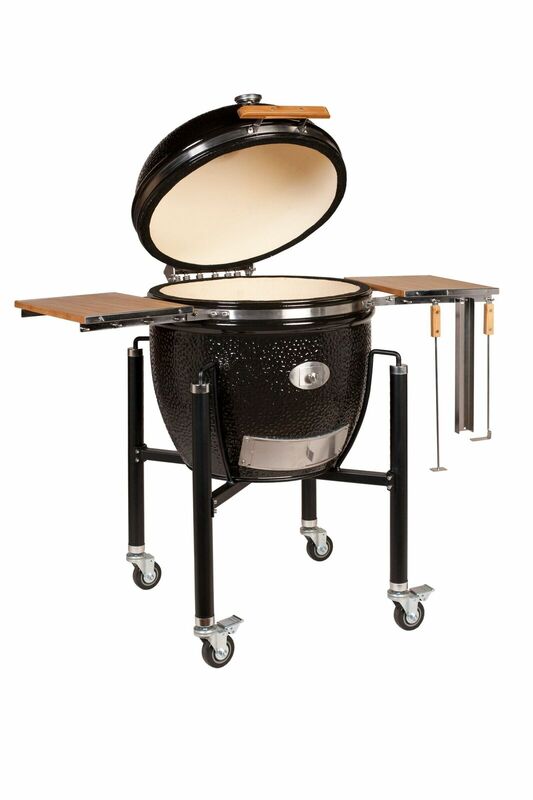 Some grills come with the capability for cold smoking as standard. The best (and most expensive) example of this is Jensen Grill and it's quite unusual for a gas grill to have cold smoking capability because most affordable cold smoke generators have a perforated base which means that ash will drop out of the bottom. Depending on the design of your gas grill this may not be desirable. All of the cold smoke generators listed below however work fine with both charcoal, ceramics and wood pellet grills. Below I've tried and tested (as you can see from the photos!) 3 of the best cold smoke generator kits available. This style of cold smoke generator looks like a maze. In essence you fill the mesh channel with wood shavings, light the tea light candle at the outer end which in turn gets the wood shavings to smoulder. Once the wood shavings have taken light then you extinguish the candle and inch by inch the shavings smoulder and release smoke. Price-wise at £34.99 these are at the cheaper end of the market. There are cheaper clones also available but I've no experience of using them. Any sign of dampness in your wood dust can cause the cold smoke generator to extinguish mid way through a smoker and there's clearly no alarm to let you know! Your wood dust must be dry, try putting the dust overnight in a warming oven prior to smoking if you're concerned about damp. If produced by chainsaw then they could be contaminated with chainsaw oil and so taint the flavour of you food. In other words, you're OK until you've run out of the bag of shavings that come with the kit but then what do you do? There are suppliers of food grade wood dust on the internet, I get frustrated at paying the carriage charge on such a low cost item but I guess that's life. The burning tea light candle can emit a surprising amount of heat and depending on the insulation of your smoke chamber and the ambient temperature you can easily take the chamber over 30°C. Finally, you have to extinguish the candle once the shavings have taken and to do this you must remove the candle from the smoker otherwise you'll risk tainting your food if you just simply blow it out. It's best to get the sawdust smouldering and the candle extinguised and removed before closing the door / lid on your food chamber. It's not too difficult to overcome all these cons (just a pain) and the low cost of these cold smoke generators may make you more willing to accept the downsides. Available from Hot Smoked in Devon. 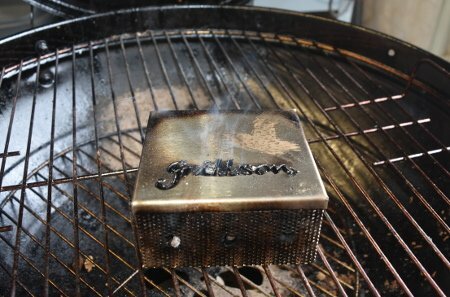 The Grillson cold smoke generator is basically a perforated mesh box which you fill up with wood pellets. 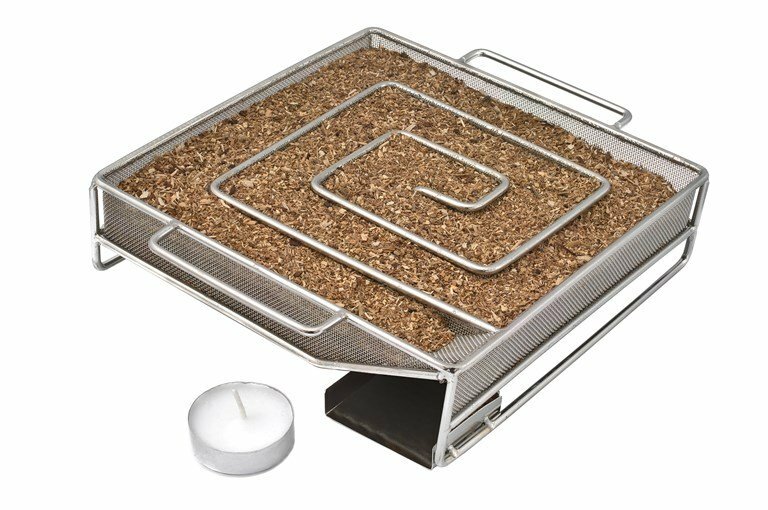 It has three holes to one side to help you ignite the wood pellets with the hand held gas torch which is supplied as part of the starter kit. 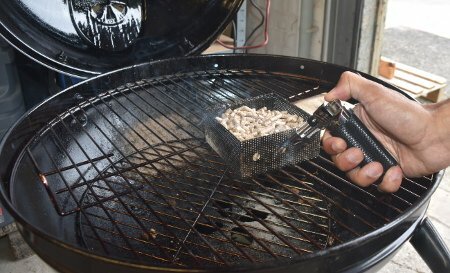 Once ignited, you can place the Grillson in the firebox of your smoker or just to one side of the food to be smoked and the smoke generator will slowly burn the wood pellets. 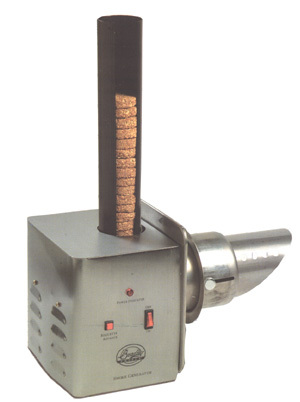 The Grillson cold smoke generating kit uses wood pellets. 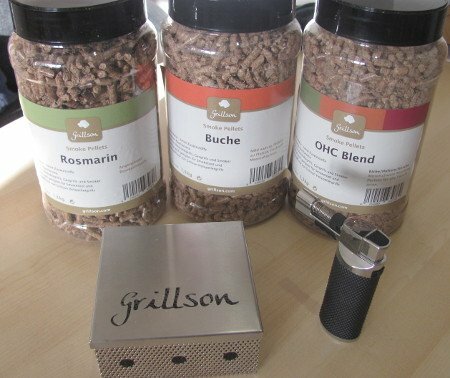 Indeed Grillson offer 14 different flavours of wood pellet and I'm sure that they would love you to keep buying theirs but the truth is that you can use any food grade wood pellets in this kit. That said, go for the higher quality pure wood pellets, not the oak blended ones used to fuel a pellet grill. Note: The Grillson pellets are supplied in air tight plastic jars so no problems with moisture ingress. 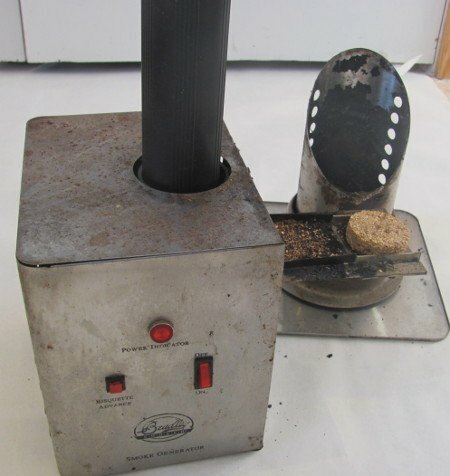 A 1.3Kg jar costs about £10 so the approximate running cost of the Grillson cold smoke generator is about £0.40 / hour. The gas torch makes the ignition process extremely quick and easy, just give the pellets a good blast through each of the three holes in the smoke box and as soon as they are glowing you can place the box on your charcoal grate, job done. 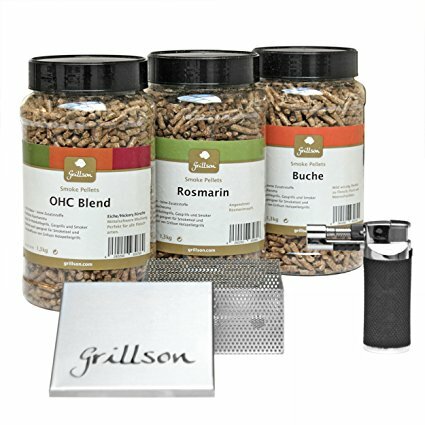 As I said at the top, the Grillson kit is well presented and gives you something to "get hold of" and in that respect it also makes for what could be a cherished gift. The Grillson cold smoke generator will run for about 5 hours before it needs to be replenished. That's probably enough for most smokes but if you were cold smoking salmon then you will probably need to refill the box halfway through your smoke. It also only comes as part of the kit and whilst this does include an abundance of wood pellets (and an excellent flame gun) it's at the higher end of the low cost options. Refined, effective and lots of flavours to choose from. Available from BBQ Barn in London. 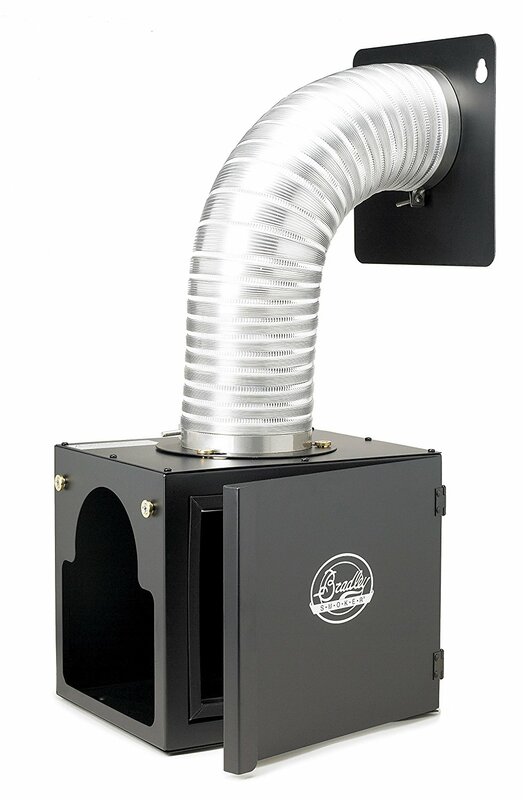 The Bradley smoke generator is essentially the control unit that is supplied with a Bradley smoker. It is fuelled by the Bradley range of bisquettes. Aside of the electronics the Bradley smoke generator consists of a vertical bisquette storage tube, an electrically controlled feed and a hotplate onto which the bisquettes are pushed where they smoulder. 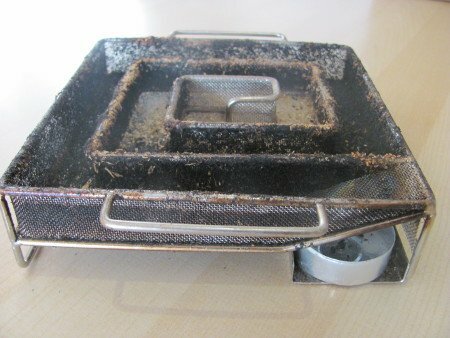 Used bisquettes are then pushed off the hotplate and into a water pan in order to extinguish them. I tried using this smoke generator direct into a large cabinet but sadly the hotplate still kicks off a significant amount of heat so if you want to cold smoke using one of these units then you really do need to purchase the cold smoke adapter which inserts a length of tubing between the smoke generating unit and your cabinet. It's a continuous feed so provided you have filled the feed tube with sufficient bisquettes then in theory you can just let it run for up to 9 hours. The smoke generating unit runs on electricity so you must have your system under cover so no water gets into either the electronics or the bisquettes. It's expensive to buy. The basic unit is £179 and the cold smoke adapter a further £95 so you're not going to see any change out of £275. These units are also expensive to run because you have to use the Bradly bisquettes. One bisquette is consumed every 20 minutes and each bisquette costs approximately £0.33 so you're looking at an operating cost of £1 / hour excluding electricity. Expensive but reliable, perfect for the enthusiastic amateur or semi professional smoker. Buy through this Amazon button and you help pay it forward by contributing to the continued development of this website... and it doesn't cost you a cent!